Read this... The International Monetary Fund (IMF) will NOT back down; they insist that Haiti has to raise its gas prices, something that nearly destroyed the capital less than a week ago. 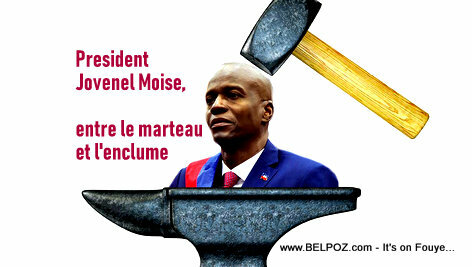 What is President Jovenel Moise to do in a case like this? IMF claims Haiti's low fuel prices disproportionately benefit the rich but try telling that the Haitian people! Haiti signed an agreement with the IMF so she can borrow money. Unless she keeps her part of the deal which involves instituting several reforms including raising fuel prices, something that is costing Haiti $160 million a year in uncollected revenues, Haiti will not have access to 96 million dollars in low interest loans and grants from the International Development Bank (IDB), the World Bank, and the European Union. Read more from the Miami Herald. After the gas price hike riots, the president said "the people have spoken and I listened". The president needs to gather enough balls to tell the people "I don't have a choice." Would this be a punishment because of the Venezuelan Vote? New Haiti PM classify gang activities in the capital as "armed guerilla"